Meet the lovely Nina, she has been coming to us for the last year and we genuinely love seeing her and our regulars. It’s as if you’re seeing your friends, catching up with them and being on their journey and that’s exactly how we felt with Nina. She initially came to us for lip fillers and after getting to know us, she knew she could trust us and decided to have the cheek fillers treatment. After a couple of months Nina shared how she felt with us. It was as if over time the volume in her cheeks had slowly reduced and her face was starting to look smaller, as a result, it was affecting her life. As a Finance Advisor, she wanted to feel confident when she was in front of clients. She came to us to enhance her natural features and add volume to her cheeks. Scientific research also shows hyaluronic acid is naturally presented in the cheeks, yet over time it reduces as you age. Many celebrities and influencers use cheek fillers as they contain hyaluronic acid which temporarily replaces this volume- giving you a lifted and youthful look. We advised her we don’t recommend plastic surgery due to the risks and long-term implications, instead our cheek filler treatment was an ideal solution. We use only the best dermal fillers; ‘Juvederm’ which can last from 6-12 months. During the procedure a small amount of cheek filler is injected evenly onto the cheekbone for natural results. The more you build up the fillers over time, the longer the effects will last. Nina decided to build up her cheekbones over time with 0.5ml Juvederm filler. The pictures below show how her cheeks looked before and immediately after treatment . You will be able to notice how her cheekbones are lifted and more defined. Nina returned for a top up every 3-months over the last 12 months to achieve the volume and maintain it. We specialise in natural enhancement, so the treatment is never drastic. Also, the fillers we use are reversible and carry minimum side effects as they have been used and tested on for a very long time. Many women and men ask us how painful are cheek fillers and we always like to share, if you go to a trained and qualified practice, they should use instant numbing cream prior to the treatment and the industry’s best fillers which also contain anaesthetic. The best practices use our VIBRATA by the world famous Dr. Simon Ourian so you will feel minimum to no pain during the procedure. Nina went on to explain the cheek fillers has given her a subtle enhancement, whilst adding that volume back to her cheeks. Even her close friends noticed a difference in her from confidence and appearance, but could not put their finger on it. She said that’s exactly what she wanted, discrete beauty enhancement and it feels great. Thank you for letting us share your journey Nina and I hope it helps many of you too. If you're still unsure about cheek or lip (dermal) fillers or have any questions, please don't hesitate to contact us. Don’t worry, we are a qualified and trusted practice so you know you’re always in safe hands with Escape Aesthetics. Alternatively, you can always book your free consultation. We hope you’re enjoying our client diary blog experiences- today we wanted to share Rebecca’s story on how medical microdermabrasion has cleared her skin. Rebecca came to us with troubled skin and decided to try our medical microdermabrasion treatment. Many clients ask what is medical microdermabrasion and how does it work? Medical microdermabrasion can only be carried out by medical professionals and is 3x more powerful than your standard microdermabrasion. Therefore, less sessions are needed to see results! We asked Rebecca how she felt before her treatment. Medical Microdermabrasion is great as there is no downtime and your skin may just be slightly red for a couple of days. Rebecca came to us for four sessions every 2 weeks. Each session included a 30 min appointment using our derma-genesis machine which is the best available machine on the market today. A natural home-made face mask was created specifically for Rebecca’s skin type and applied at the end of the treatment. Rebecca noticed a massive reduction in her blemishes after the first session! She felt her skin was clearer, brighter and much smoother. We asked Rebecca how she felt during her treatment? 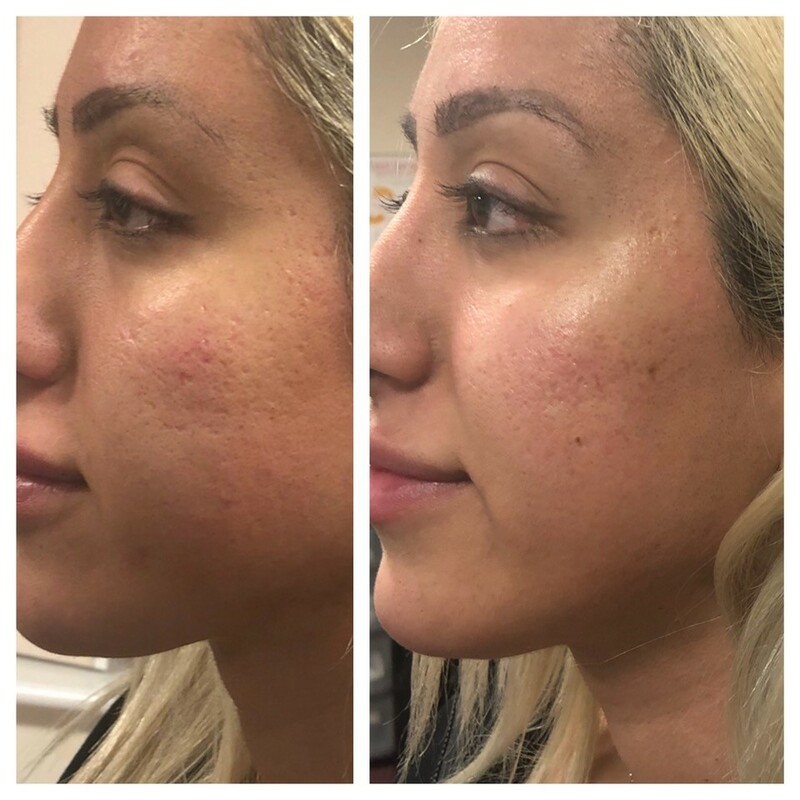 Rebecca has had four sessions so far and as you can see from the picture below her skin is looking great! Her skin is less oily, blemishes have completely reduced and there is also less redness. We asked Rebecca how she felt after her treatment? Thank you for taking the time to read our clients experience with medical microdermabrasion. Visit our Instagram or Facebook to take part in our giveaway to win a £150 gift card to spend on skin treatment with us! If you have any questions, feel free to contact me through Instagram or Facebook. Welcome back to our client diary experiences and thank you to Jade for allowing us to share her story. Jade came to us a few months ago suffering with severe acne. After some discussion we decided to begin her treatment with 6 sessions of superficial chemical skin peels using glycolic acid and NEOSTRATA home-care products. If you’re wondering what is a chemical skin peel? Well…This is a process where medical grade glycolic acid is applied to the skin for 5 minutes to dissolve dead skin cells and unclog pores. This should only be carried out by medical professionals! Chemical skin peels are great to help with acne, acne scarring, pigmentation, sun damage, fine lines & wrinkles, uneven skin tone and generally to give you a brighter skin complexion! The best thing about these superficial skin peels is that there is no downtime! No days off work needed! Your skin may be a little red for a couple of days and there may be some flaking of the skin during the first week after your treatment. We started off with 30% clarifying acid (containing citric acid + mandelic acid which is great for acne prone skin) This skin booster is applied for 2 minutes before applying 20% glycolic acid for 5 minutes The percentage of glycolic acid was then increased every 2 weeks until 70% was reached. Jade noticed her acne drying out after the first peel. The cystic acne had reduced significantly and the skin was beginning to look a lot clearer. During the treatment she was also using a glycolic acid face wash x2 day to boost her results further. Glycolic acid works by exfoliating layers of the skin to encourage new skin cell growth and remove dead or damaged cells. This also helps to prevent new acne breakouts! We asked Jade how she felt during her treatment? I'm now on my 4th skin peel, and I cannot fault anything! The ladies are so friendly and have offered me great advice. My skin feels amazing. Got plenty of sessions booked for the future. 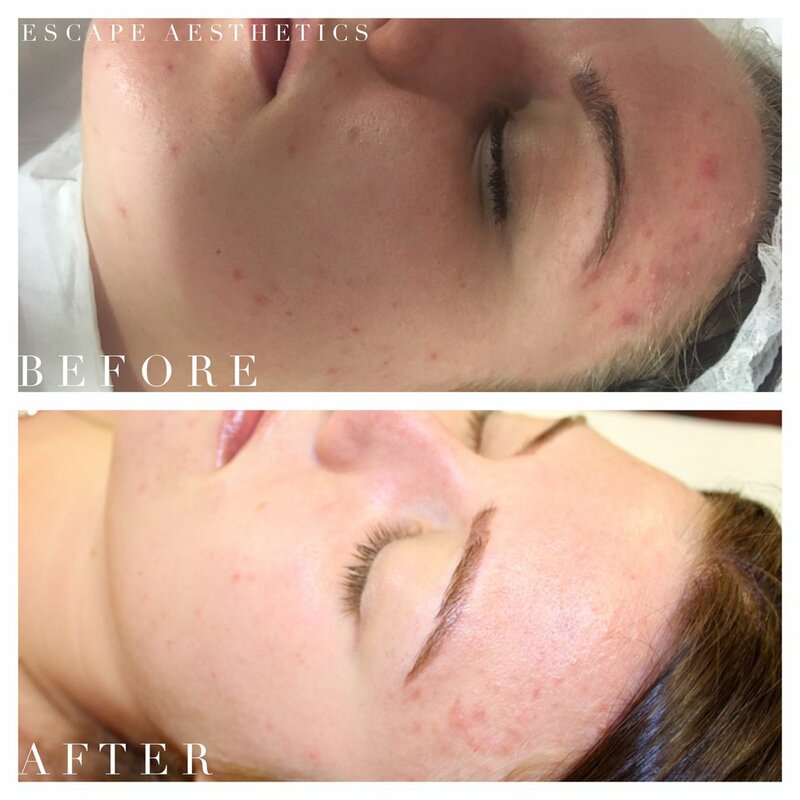 Jade completed her 6 sessions and as you can see from the pictures below her skin was looking much better! Less redness, reduced active acne, reduced large pores and the skin was less oily. Jade decided to book in another 3 chemical skin peels before moving on to medical microdermabrasion to help with the acne scarring. Thank you for taking the time to read our clients experience with chemical skin peels. Are you suffering with acne or past acne scarring? Hi Ladies! Hopefully this is the first of our many ‘client diary’ experiences! So of course we thought we would start off with someone who put their trust in us from the very beginning! Since her first lip filler experience Ruhina has been back to us a few times and has been extremely pleased with the results. For those of you who are unaware, lip fillers are a non-surgical way to enhance your lips by defining the border or adding more plump to the lip body for fuller lips. We pride ourselves in providing natural treatment- enhancing your natural beauty! We use lip filler products which are known to be the best fillers on the market. These are made up of hyaluronic acid which is what your lips already contain. The fillers have no animal/human products and they are completely reversible. One of the most common questions is how long do lip fillers last? From our clientele experience the lip fillers we use have lasted 6-8 months- which is exactly what we want! This lovely client decided to initially go for 0.5ml lip filler as this was her first time experiencing lip injections. If you’re wondering how much do lip fillers cost? The prices start from £125 and depend on your desired look. All treatment is tailored to your personal expectations! "The first time I considered lip fillers I was a little anxious but having spoken to Aniqah and with her reassuring me throughout the consultation I knew I was in good hands." Many clients ask us do lip fillers hurt? Ruhina felt minimum pain during treatment and she also experienced minimum bruising & swelling post-treatment. Soon after her first experience with us Ruhina returned for another 0.5ml top up to achieve her desired look. As you can see from the picture below her lips looked absolutely stunning! Defined, plumped and still so natural. We believe with world class fillers and the best technique your lip fillers should last you 6 months or longer! Our customer service is second to none and we want to do everything we can to help! The Vibrata™ designed by the world famous Kardashian cosmetic surgeon is used with all of your treatment for minimum pain, bruising and generally a more comfortable experience (this definitely helps if you have a needle phobia) We also provide you with ARNICA GEL at the end of your treatment which is best known to prevent bruising. Other side effects from lip enhancement & augmentation is very rare as the product used is all completely natural. "Honestly, I have loved the outcome every time! The work speaks for itself! Couldn’t thank these ladies enough and of course I shall be returning very soon!" Thank you for taking the time to read our first client diary entry. Stay tuned for lots more client experiences to come! If you have any questions, please feel free to contact me through Instagram or Facebook. Hi ladies and welcome to our first blog post! I wanted to give you all an insight to my personal experience with Anti-Wrinkle Treatment for my frown lines so, here it goes! Some people ask, what is Anti-Wrinkle Treatment? Well, Anti-Wrinkle Treatment is a prescription only drug that temporarily ‘freezes’ the muscles so they are unable to contract. Usually, the contracting is what causes your wrinkles or fine lines making you look sad, angry and tired. One thing many people do not know is that the earlier you get Anti-Wrinkle Treatment, the better the result is long term. Not many people know a lot about how Anti-Wrinkle Treatment works or its benefits nor do they know how easy it is to be free of those frown lines. Not only is it an easy method to get your skin feeling refreshed and rejuvenated Anti-Wrinkle Treatment is also reversible! It lasts for around 6 - 12 months with the process itself being quick and easy causing minimal pain! Not too long ago, I ventured out and decided to do something about my own frown lines that had been getting me down. I am 23 years old and have personally always been conscious about my frown lines because it is in my genetics and I do tend to frown all the time. Without realising, I would find myself frowning whilst driving, thinking, talking, when sad or stressed. I was becoming more and more conscious of it and noticed that I was developing a faint fine line, which became even more prominent when I wore make-up. My make-up would crease at the end of the day and application was not smooth nor did I feel satisfied with its finishing. I wanted that flawless skin look but my frown lines were making it difficult. It wasn’t just about how the lines looked I was also beginning to get headaches from frowning all the time. I knew Anti-Wrinkle Treatment around my frown line would stop me frowning, possibly making me feel better and preventing those fine lines from getting any worse! Eventually, I decided I was going to get the Anti-Wrinkle Treatment done but I was quite nervous as I had never had it before. My fear was more to do with the pain however, the fact that it would only take a few minutes comforted me a great deal. Before the treatment, the area was cleaned, make-up was removed and markings were drawn indicating where the injection would go. The fine needle was injected into five injection sites. How did that feel? Honestly, I felt the initial injection which felt like a sharp scratch but it was over in literally 2-3minutes! I was surprised at how quick the treatment was. There was hardly any bleeding and it only felt a little sore which also disappeared after 10-15minutes. What felt amazing was the fact I could feel the stiffness around my frown line already. An absolutely brilliant result! After the treatment, a tissue was used to dab the area. You could not tell I just had the treatment done; I was able to go into town straight after with no worries! For the rest of the day I was advised to exercise the muscles, wear no make-up, avoid touching the area and sit up right. I could feel the stiffness of the muscles and it really felt like it was working. Two days after treatment, I could not frown as much as before and the dynamic lines were reducing dramatically which you can see below. I genuinely felt like my make-up application was a whole lot smoother and my complexion looked so much better already. My close friends and family could notice there was a difference and complimented on how natural and flawless my skin looked. One week after treatment: my frown line had completely gone and I could no longer frown which felt amazing. When I could feel myself frowning I would look in the mirror and realise I actually wasn’t. This was because I was unable to, resulting in no fine lines/wrinkles! This was exactly what I wanted; to prevent my fine lines from getting any worse, stop my headaches and stop looking sad, angry and stressed all the time. It’s so important that we feel confident in our own skin! Wrinkles and lines, well, they’re things that can really have a negative impact on our self-esteem but there is a way to fix that. I would 100% recommend this treatment as a preventative for someone who is worried about their fine lines getting worse, or someone wanting a flawless complexion- Giving you that smooth make-up application and youthful appearance. It was honestly the best thing I have had done! Thank you so much for taking the time to read about my personal Anti-Wrinkle Treatment experience. Stay tuned for our future posts, we’ve got great things in store for you.